With a fist pump of excitement, Spirit Lake native Will Norris accomplished a dream when he was first to cross the finish line at the Scotiabank Toronto Waterfront Half-Marathon in a time of 1:05:30. The international race was held October 21, 2018, and it had over 10,000 competitors racing through downtown Toronto and along the shores of Lake Ontario. 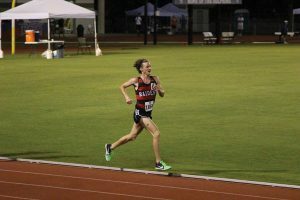 “It was inspiring to be a part of an event that drew so many elite distance runners, and it felt great to set my own personal best on such a big stage,” Norris said. A highlight to Norris was sharing the first 7k of the race with Cam Levins, who became the new Canadian record holder in the full-marathon. Norris and Levins ran alongside each other, until the races separated. Norris is a familiar name among many local runners and coaches, as his successful running career began a decade ago. It wasn’t uncommon to see his long strides and curly hair running down the streets of Hill Avenue or along the Iowa Great Lakes Trail. He found success at Spirit Lake High School, finishing in the top four in the 3200 and 1600 meter runs at several Iowa State Track Meets. As a senior, Norris won the 2012 Iowa Class 2A State Cross Country title. After graduating in May 2013, Norris went on to attend Northwestern College (NWC) in Orange City with cross country and track scholarships. However, the transition from high school to college wasn’t an easy move. Spending time abroad changed Norris’ perspective and provided him with the focus to train harder and be a leader on the Red Raiders’ cross country and track teams. 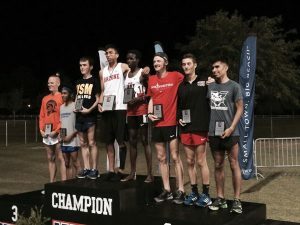 In the fall of 2016, Norris had his first major collegiate accomplishment, when he placed third at the NAIA National Cross Country Meet. His previous finishes were in 111th and 112th place at the national meet. “This was a huge breakthrough for me,” he said. Later during his senior year, he ran a personal best at the South Dakota State University indoor meet and qualified for the first time for the indoor track national championship in the 3k. In the spring of 2017, he finished in fourth place in the outdoor 10k at the NAIA National Track Meet. “I had the opportunity to run at track nationals for the first time in my college career,” Norris said. He finished his NWC career as a two-time NAIA All-American in cross country and track. After graduating from NWC, Norris moved to Boulder, CO. His running abilities and times qualified him to train with a semi-pro group called Roots Running Project. He trained with them until April 2018. “It was cool experience to train with a professional group for a few months, but honestly, I found out pretty quickly that it wasn't for me. The status and gear and all that comes with this type of group isn't everything it's cracked up to be, and I found the whole ‘professional’ thing to be a bit off putting,” Norris said. He said it was a struggle to work full-time, pay the hefty coaching fee, and train alongside people he felt were way out of his league. Suddenly, he found himself doing workouts too fast, burning out, and ultimately running slower times than during college. This led to a change, and Norris is now working remotely with a Canadian professional distance coach from Kingston, Ontario. 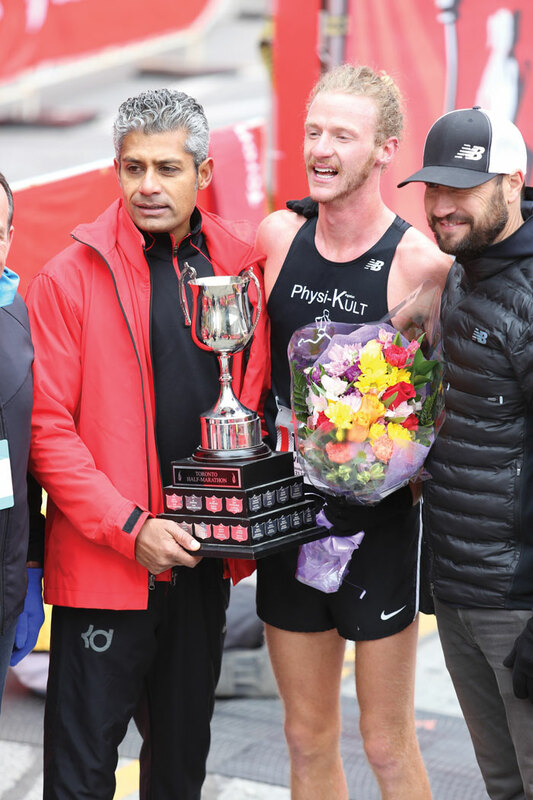 Norris relies on his coach to provide a plan for any upcoming races, and it’s what he followed leading up to the Scotiabank Toronto Waterfront Half-Marathon. The training contains lots of long workouts and miles spent running Colorado trails and roads. In 2019, Norris has plans to run another half-marathon; this one in Houston. Afterwards, he will begin preparations to run a full marathon. “My coach has trained a lot of elite marathoners, so I trust him to write a training plan that will give me the best possible chance for success,” Norris said. Most of all, he wants to keep running fun. Running isn’t always easy for Norris, as he battles asthma. Throughout the years, it has played a factor in his training and how he competes. Despite the asthma battle, Norris doesn’t use the obstacle as an excuse – just something to overcome. He enjoys running and believes it’s an activity that anyone can do. Norris believes that running is a process totally worth someone’s time and energy. It’s this motivation that keeps Norris running every day, with his eyes already set on his next goal—Houston.